The Lake Mead National Recreation Area headquarters will have a new look next year after its landscape undergoes a redesign to conserve more water. The building’s current landscape, which consists mostly of grass, trees and shrubbery, requires more than 2 million gallons of water per year to maintain, according to park archaeologist Steve Daron. The new landscape, set to begin installation in December and take about three months to complete, will have far less grass and more desert features, Daron said. The headquarters will reduce its water consumption by 25 percent, or about 500,000 gallons of water per year for the first couple of years after the redesign is completed, Daron said. That percentage would increase to between 50 and 60 percent after the vegetation is fully established. The new landscaping will remove three ash trees, nine pecan trees and the lawn between the headquarters and the parking lot near the intersection of Wyoming Street and Avenue B. The lawn and other plants in front of the headquarters facing Nevada Way and Wyoming Street will not be removed. Bruce Nyhuis, chief of engineering and maintenance for the recreation area, said the project is connected to another one that calls for the replacement of underground piping. Both projects will cost about $150,000 combined, he said. Daron said the new landscaping will not only save water in the long run, but it will give the headquarters a more authentic feel with boulder groupings, as well as indigenous vegetation, including golden rabbitbrush, Mojave aster and beargrass, among many others. Nyhuis added that talks had been in place for about five years to make the project happen. 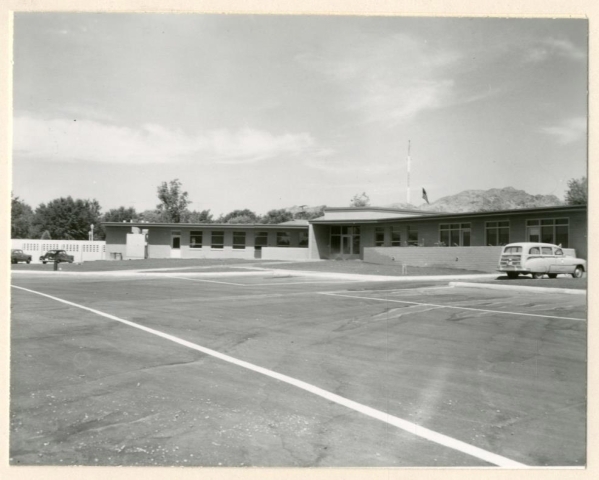 The headquarters was originally designed and built from 1951-53. Lake Mead finished the month of June at 1,075.08 feet, its lowest level since 1937. According to the U.S. Bureau of Reclamation’s two-year study, the lake is expected to dip to 1,063 feet by June 2017.